I know Streetsblog and the amazing Dmitry Gudkov already have this picture covered, but it’s too good to escape my attention. 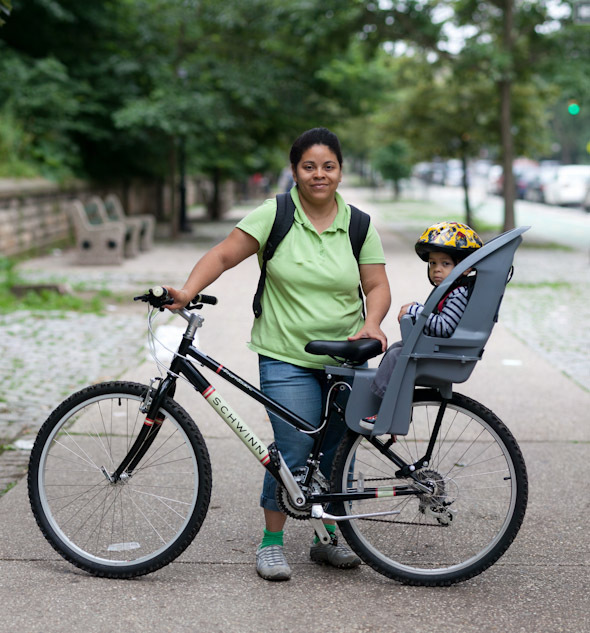 In March, I wrote this about the Prospect Park West lawsuit: “Nominally, the target of NBBL’s Article 78 lawsuit is the Department of Transportation, but it might as well be neighborhood itself.” Well, add Adam (pictured in the seat on his mother Cynthia’s bike above) to the list of people who stand to lose if Jim Walden, Louise Hainline, Iris Weinshall, and Norman Steisel are successful. This is what we are fighting for, and what the cynically named Neighbors for Better Bike Lanes and Seniors for Safety are suing to remove. *Hello, Jim Walden! Even though no one in NBBL has actually said this, Louise Hainline’s so called “compromise” — one-way, class II bike lanes on PPW and 8th Avenue which is really no compromise at all — would mean parents would have to ride alongside traffic with nothing separating them and their children from cars other than paint. Is that what she really wants? You really shouldn’t refer to Louise Hainline’s bike-in-traffic scheme as a “compromise.” A compromise requires parties with many different views to sit down at a table and come together in agreement. The bike lane that is currently on PPW is the result of compromise forged over the course of years of community meetings and workshops attended by a variety of stakeholders and taking many factors into account. Instead of participating in that process, Louise Hainline and friends chose to sue everyone instead. NBBL would like for everyone to think that their plan is some sort of “compromise” but that is entirely the wrong word to describe their scheme. Don’t let them have that frame. Excellent point and you’re 100% right. >would mean parents would have to ride alongside traffic with nothing separating them and >their children from cars other than paint. Is that what she really wants?